While these apps differ by what they sell, they definitely face almost similar challenges when it comes to developing and maintaining them. What starts as a simple app built on top of iOS, Android Java, couple of backend languages and databases, quickly evolves into a complicated technology piece that can have as many as 15+ programming languages supporting it. If you aren’t careful enough while building eCommerce apps, you can end up making more mistakes than you can count. Consider the example below. 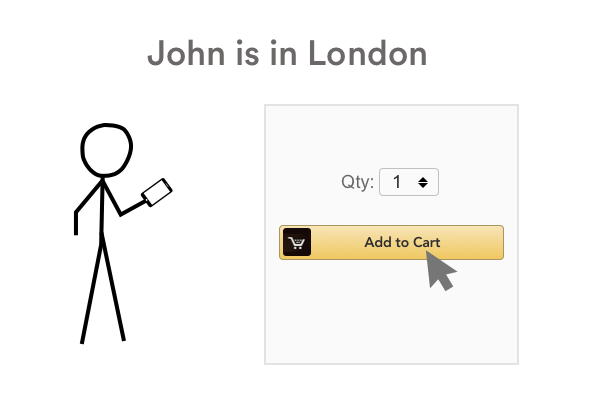 John adds an item to cart when he was in London. He then travels to New York and logs into his account to complete the purchase. When he logs in, he sees an empty cart! I can go on, but you get the idea, right? You can use Node.JS for API design and Python for server side programs – your choice! If you understand what performance you can get from a particular language or a server framework, you are no longer bound by limitations to only use a few of them. 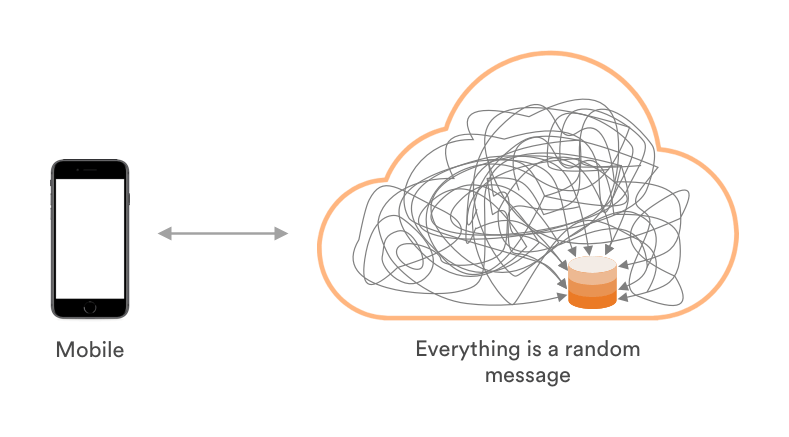 Unstructured data like emails, customer data can be stored in a NoSQL database. Whereas any structured information will now be stored into a MySQL database. Using specific databases for specific usage not only improves performance, but also reliability in case of eCommerce apps. We have third party services operating in a separate server(s) from our core service. As we don’t control 3rd party services, they are a significant risk to our core infrastructure. If not well separated from our app infrastructure, their failures might cause your entire app to break down. Having third party services on a separate servers eliminates this risk. We now are using a Search as a service – ElasticSearch. It speeds up the way your system pulls information from your database using highly optimised indexing. It is worth noting here that search is one of the most frequently used part of an eCommerce app and has to perform really well. With a caching service, we look at the most frequently requested information, and create a data store (cache) for it separately. Now, when the same information is being requested by a user, it won’t go to your database, but, would instead be delivered from the cache. While this might seems like a good architecture for a proof of concept or an MVP, but it won’t work in cases where you are trying to achieve high growth or volume. eCommerce apps are supposed to follow a MVAP (Minimum Viable Awesome Product) philosophy right from the start. 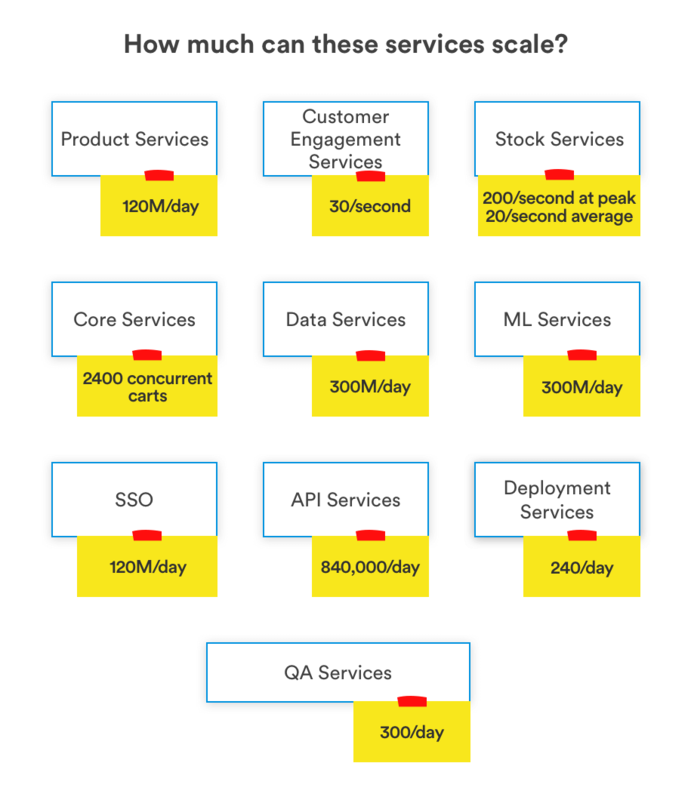 We do see information on how load balancers, server capacity and storage that we have – but we don’t exactly see how internal services are going to work with each other. 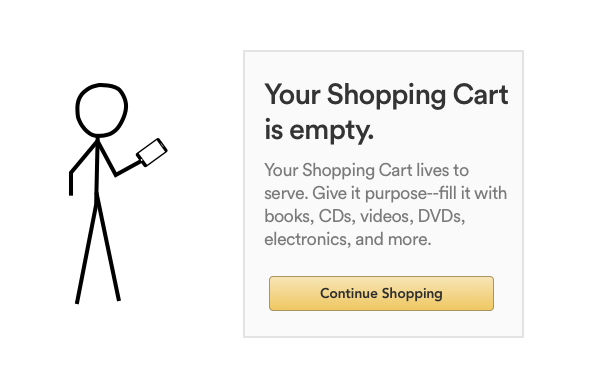 So, that leads to a situation where we don’t know how to ensure “Adding items to the cart” works all the time, especially during a high velocity sale. In this diagram we see that we have Database clusters that are connected with our services. There would be situations in which a particular database is heavily occupied by search queries, but our other services also need it for processing transactions. How are we going to determine which service to prefer? How are we going to decide from millions of possible problems which service to prefer? 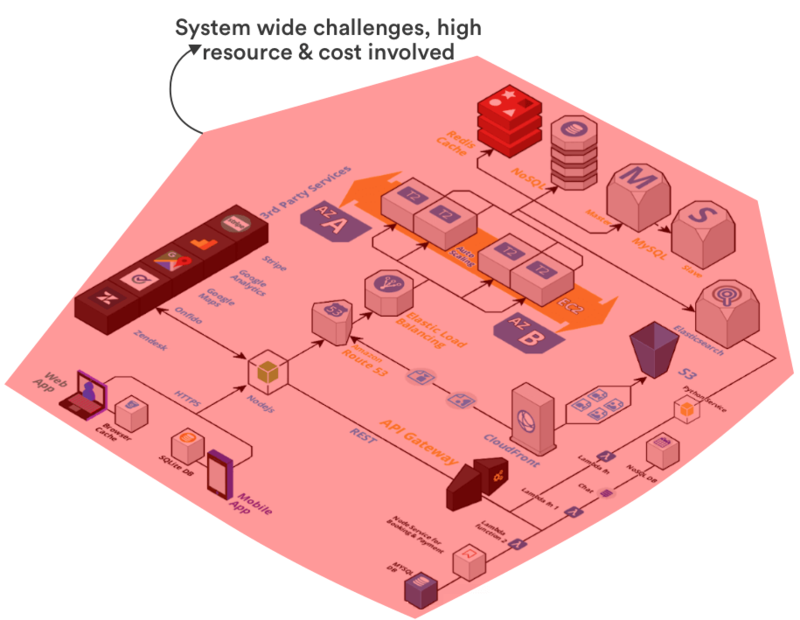 How are we going to make sure that information delivery is fast enough under all loads? There are no definition of any of these things. Simply put, we don’t know predictably how this system would perform at all. 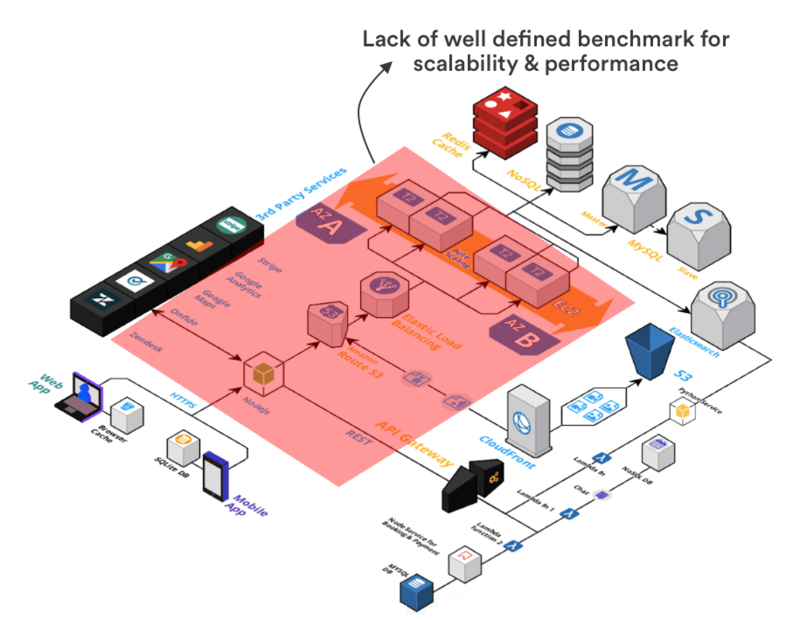 While we do expect it to perform relatively well, but it wouldn’t do so without having you bleed capital on unnecessary resources like costly servers, load balancers, etc without any empathy towards engineering best practices. Let’s say thousands of dollars spent on advertising and influencer marketing did brought in 100,000+ potential buyers to your ecommerce app. If you don’t have a tech infrastructure that can scale reliably, what’s the point of spending all of this capital? Now, this is a scale that most eCommerce apps have to develop keeping in mind. Your goal is to make sure that your entire system is and what capacity it is capable of serving. And, now that we have these numbers with us, our thinking would shift from scaling entire stack to scaling different services (cart, product search, etc) to match these benchmarks. We will now break down our app into different services each of which has its own goals to serve. This is called following a microservices approach. 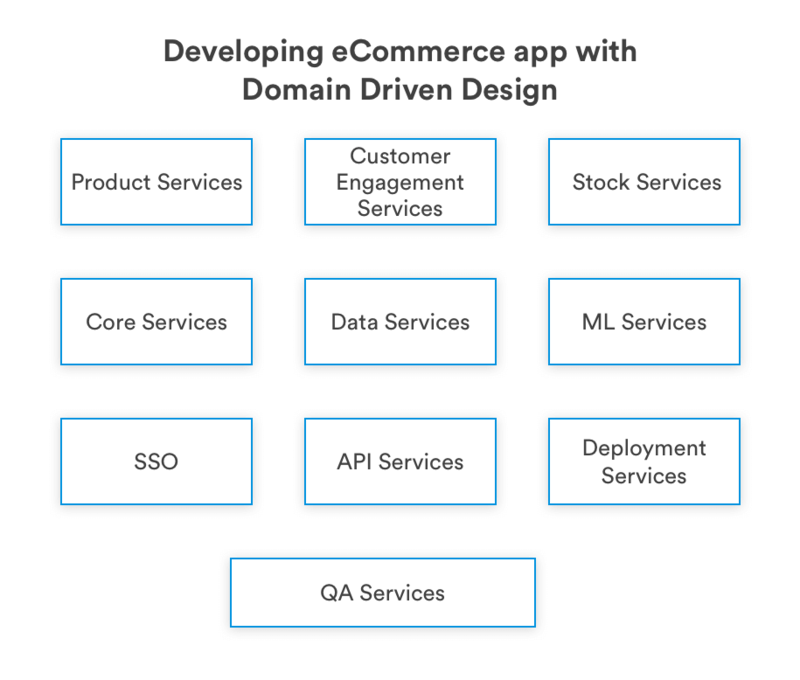 Since eCommerce apps are extremely complex and they keep evolving, it makes sense for us to follow a domain driven design here. With a domain driven design, we have specific teams and stakeholders responsible for each services. 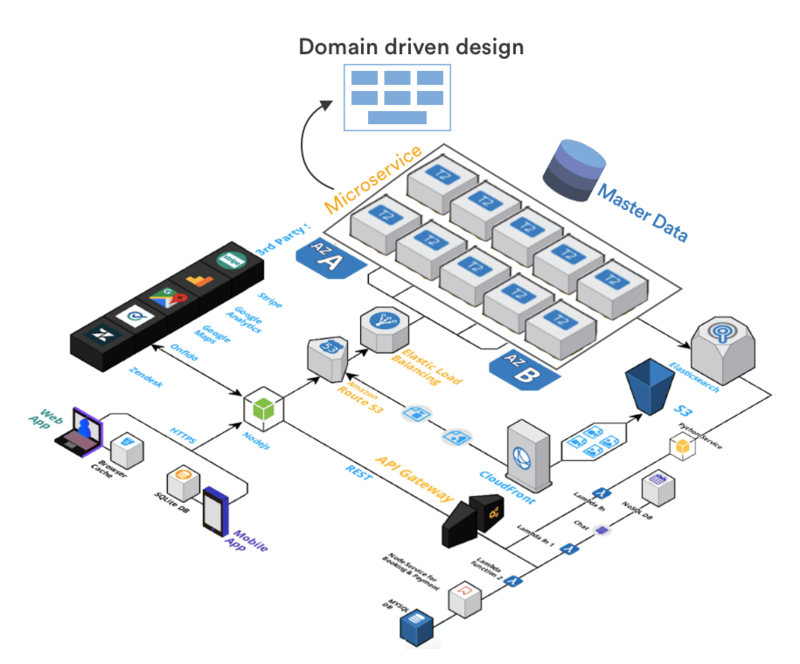 Based on domain driven design, let’s evolve our ecommerce app’s server code into microservices. You’ll notice that our code is now divided into a bunch of well defined microservices. The image below shows you the top 10 microsevices that you would absolutely need in order to build a high performing, scalable ecommerce app. While, I am going to cover developing eCommerce microservices in another blog post, I walk you through why they are extremely important for eCommerce apps. Now, let’s say if from a single server based service, you can at max only deliver product search to 1000 concurrent customers, you easily know how many servers it would take to handle 10,000 concurrent product search requests (1000 requests ~ 1 server, 10,000 requests ~ 10 servers). And thus you can reliably scale each of these services. Another benefit of following a domain driven design is that the app becomes 100% testable. And, if you are planning to automate code deployment to your app, this would be extremely helpful. All in all, this is what this architectural was actually benchmarked and tested for. If you interested in reading about eCommerce frontend development of your app, here’s a blog post that I wrote on How to make an eCommerce site using ReactJS? Now that we know what each service is capable of, individual stakeholders of each services can now scale these services up and down independent of entire ecosystem. This would also tell you what parts of your ecommerce app aren’t good enough for business requirements. You can exclusively focus and improve those parts. For example, if you see your implementation of ElasticSearch isn’t good enough to deliver product search results in less than 200ms with a load of 1,000 concurrent users, you can look for alternative solutions. You can test alternatives and see how they work and deliver results, without significant investment and without breaking anything else. What really happened with John’s empty cart? Coming back to the empty cart problem that I shared at the start. 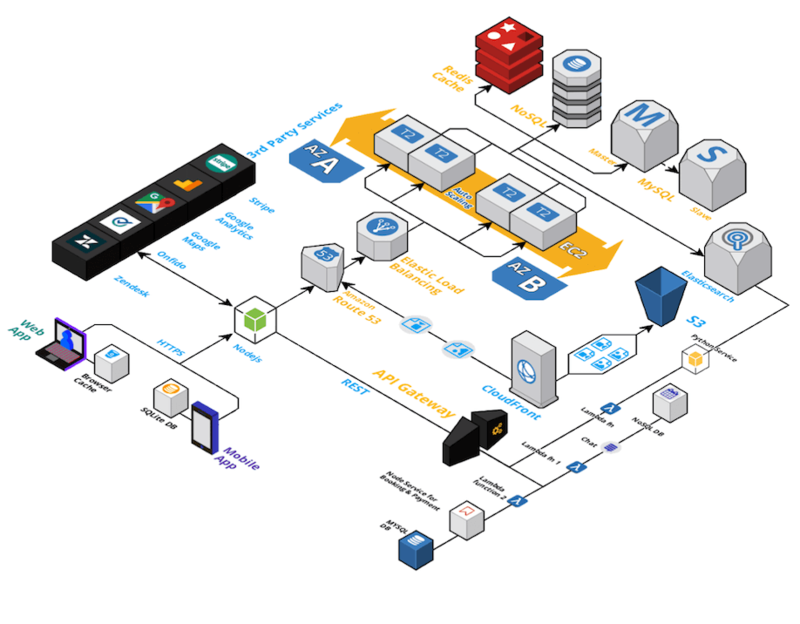 Without well defined microservices, when John added an item to his cart, it was added to a geo-local database. Our app assumed that John lives in this region and won’t move out. Without domain driven design, stakeholders, product managers and developers had no idea that this could actually happen to them. We usually build a golden record to handle such use cases. When we do that, we have a well defined and controlled boundary of data and John would be able to see this cart no matter where John lives. I hope what you have learned so far improves upon your understanding to how to build a cloud backend for eCommerce apps. 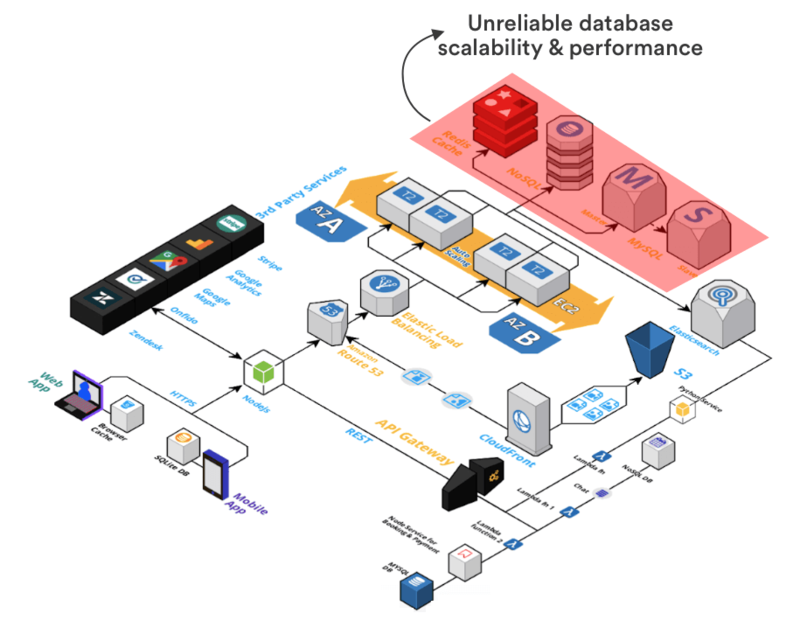 If you are interested in evaluating Serverless tech, you should definitely checkout this blog on building eCommerce apps using Serverless by Rohit Akiwatkar. A consumer usually may or may not notice this, but as an ecommerce app developer you should know this. eCommerce apps undergo constant UI changes, some are a part of improving user experience, others are there simply because they are for a one time observable event like Black Friday. App Stores aren’t very reliable in release management, and approval of an updated app version could happen sooner or later. 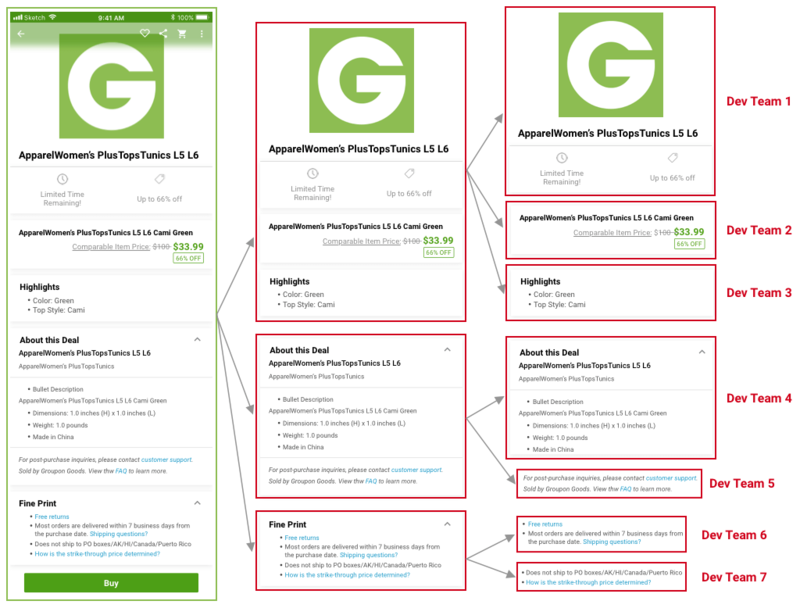 One way to do that is to plan upfront and compile all app UI in a quarterly app update. You can change this update frequency based on how frequently your users would be willing to update their app. But as a benchmark, don’t go below less than 2 months. Now, when an app user updates their app, this is all what they are going to see. These user interfaces can be activated remotely when you wish to. 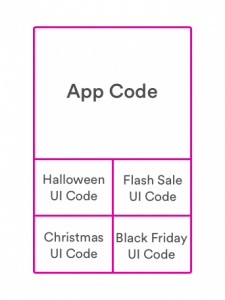 Here’s what a user that has received a dynamic UI based ecommerce app sees during Black Friday, Halloween, Flash Sales and Christmas. How do dynamic UIs work? No matter how complicated this may sound to you, they are not that difficult to implement. While we package all of these UIs in one single app update, all we have to do to activate or deactivate these contextual user interfaces is just pass a message from our servers to the app. A simple JSON message is sent over the app and activates a UI. The illustration below shows how it works. A huge concern here is that with dynamic UIs, we often end up increasing the app size. And increasing app size is one of the many criteria’s that violates the principles of developing an ecommerce app. This is where we see React Native significantly outperform native. We will talk about that in a bit more detail in the next section. If we have to push updates to your app, we either have to do it using upfront heavily bloated app size or with lengthy (unpredictable?) app store/Play store review processes. If you are planning to use React native for ecommerce application development, you can simply integrate your app with a service like CodePush. Using CodePush you can deliver small scale UI updates directly to your app users. React native again reduces the app size here as we don’t need to package everything in UI upfront, we can simply push the UI using internet. Ecommerce apps uses a lot of images, and you won’t believe how unoptimized images are still being pushed to ecommerce apps. Optimizing images can reduce the app size by 20% in ecommerce apps. If you want to develop your app with best practices when it comes to app size. It is recommended that you should write a script, an app size watcher to keep track of app size with each build. There are several plugins available that integrate easily with your CI tools and can keep track of your app size. How to build your product details screen? One of the most important parts of an ecommerce app is the product details screen. If you plan to serve a large customer base, be prepared to have a screen that evolves extremely fast. With developers pushing minimum 10 different updates/changes to this screen everyday. Product details screen is where users are going to decide whether they want to buy the product you are selling or not. Let’s take the example of Groupon’s product listing screen here. There’s whole lot of design aspect that was applied by Groupon here to scale and deliver a product screen that could supports more than 200M app users. Clearly, if you don’t deal with this properly – you are in a for a ride of your life! Groupon takes an entirely different approach to what most other eCommerce providers do while developing this screen. They break this screen into small subunits that work perfectly with each other, but are developed independently and are handled by separate teams. I won’t get into deep technical details here. But, this separation is the exact reason why developers working on “highlights” can update “highlights” section and not impact the overall performance of the screen. Whatever they do in “highlights” section is optimized and tested for performance. And the new “highlights” code can be reliably released and integrated with the rest of the screen. As screen elements are independent of each other, adding or removing them takes 10% of the original effort had this practice not been in place. All of the features of the screen can be developed in total isolation. Apart from optimized consumption, we get a lot more control over what we can do with the phone’s memory here. Groupon effectively pre-load elements of the product screen on phone memory that are yet to be displayed. They do that to drastically improve the load time to 1/10 of what it would otherwise be. Groupon takes it a step further while developing their product screen. They have implemented a reliable cache and recycle information that they use effectively re-display list items efficiently. How to develop Product Image elements? I talked about the product feature screen in the section above, and I will now pickup an element from it and walk you through real life complexities here. For the sake of simplicity, I’ll go with developing product image elements for an iOS based ecommerce app as I feel it would be a lot more intuitive for everyone reading this. If these are new to you, don’t get discouraged by their names. Think of them simply as the way to implement image view elements in your app. Let’s now evaluate each of them as we move forward and find out which one will give you the best performance. Your developer places all of these images inside of ScrollView, the functionality would work fine and the performance for most parts would look just about right as well. But then, you hear an app user complaining about app taking too long time to show images. You went back to your QA and dev team, raised some tickets on your project management system, only to find out automation tests and manual tests returning the results with no errors. So, what’s really happening here? When your developer built this product image screen in your app it was implemented using ScrollView. This ScrollView works fine for around 5-10 images with varying degree of results, but for most of the part it won’t show you any flags initially. But when you have a customer that is going to upload 30-40 images of a product, downloading these images in ScrollView gets extremely expensive for your app’s performance. This is exactly what you weren’t aware of, your developers weren’t aware of, and your QA wasn’t aware of. Now, you can build this using CollectionView as well. But according to me, it’s an overkill. It was built for not just left and right, but up and down movements as well. I will get back to you on why I wouldn’t go with CollectionView at the end of this section. I would straightaway recommend you to go for UIPageViewController instead. It is the same exact thing that you see when you scroll left on AppStore. And, It is also the same implementation that you find in iBooks app as well. iBooks can help you scroll through hundreds of pages without any performance issues or apparent lags. Now, getting back to why I wouldn’t go with CollectionView? First reason, engineering is about avoiding overdesign. Second reason, every unused or partially used library increases the size of your application. App size is a major concern for eCommerce apps as each and every percentage reduction in size leads to high sales and more adoption. So far we’ve talked about perfect components across a screen. But, let’s now look into a completely different type of optimization that you can do with your eCommerce app – Standardized icon images. Developers have their own ways of implementing even the simplest possible things. The performance, code quality and consistency of doing something in this case depends upon the skill of developer. This could potentially induce a risk. Using modular approach towards developing apps result in higher quality. For example, if an image (icon23.png) is attached to an element, there’s no possible way for anyone to know how deleting this file system image would actually impact the app. Icon23.png could be attached any of the 200 screens that we have in our app. You can’t document enough in the software world. And, even if you do, documentation alone isn’t enough to resolve challenges that are widespread in the software development world. After building a list of such images, I would define one central place for each of them where I define how they would be loaded and displayed. Even the elements in which they will be loaded won’t have to worry about how this will happen. If in future, If I decide to increase the size of icons from 12px to 14px in length, I won’t have to worry about applying the same change to 100s of screen. This not only saves a lot of time, but also helps us avoid the chances of any degree of compromise on performance or code quality when a developer updates this. Any changes would eventually be tracked an linked to this central location, and we can control what happens here. If you are building an app for shopping for users on the go, giving them the ability to shop from whenever they want – you better be prepared for poor and intermittent network connections. Most likely, your app users won’t know if they have a poor network coverage, or whether your app isn’t working. They are most likely to blame your app! Your app’s user would find it irrational to lose information that was just there a few seconds ago. Even if it vanished as he/she moved from one screen to another or minimized his app. Now, this is actually a poor implementation even from an engineering standpoint as well. As engineers, we don’t control the network, but we do definitely control some of the information that the app fetches from the server. If done properly, the app can actually retain some information and function well even when there’s no network connection. I’ve written an extremely detailed blog post around this a few months ago, if you want to read it in detail, here’s my take on building offline mobile apps. For organizations that have multiple eCommerce apps, it often gets too expensive to develop these apps from scratch and maintain them. If that’s your use case, I would focus on identifying the foundational parts that are often common across these apps and just induce redundancy. Once identified, I prefer to package them in form of an SDK and consume it across multiple apps. Take the example of offline catalog storage services in your apps. You can easily see that this is something most of your apps would have as a feature. Now, while building this offline catalog service for the first time, you can carefully package it in form of an SDK. 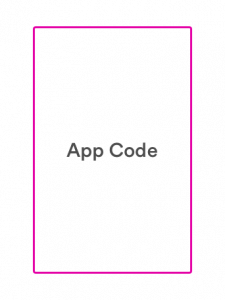 When you build another app that needs a catalogue functionality, all your developer would need to do is to call this code and that’s it, it will work out of the box. Adidas and other pioneers of mobile technologies in eCommerce leverage this extensively, they have SDKs that are being consumed in multiple other apps. That’s pretty much it for the blog post. I hope that I was able to walk you through the complexities involved in ecommerce application development, and when you develop ecommerce apps I hope some of these strategies would solve real growth problems for you.